C. Price, Kilgrace and the Singular Situation. Ragged Angel, 2013. Pp. 136. ISBN 978-1-910092-00-2. £3.99 pb/£0.99 e.
This is part of a series involving two scientists trying to get back to their own continuum after becoming stranded in a backwater where “conservation of energy and E-MC² are in effect”—which might take some time to work out, but does make sense! Susan—a humanoid (hints suggest not human) and Cet (“Killgrace”) an alien in a comprehensive life-support system—are not only not the same species, they are at war with each other. They also must co-operate to get back “home”. Here, they find themselves on a spaceship which is engaged in rescuing two “interstellar mega-fauna” from the region surrounding a Black Hole. Passing themselves off as a rescue team (fortunately they are able to hack into all necessary databases to create a plausible cover story) they join in with the operation. It’s rather like Doctor Who, though with a much more equal relationship between the protagonists. Various methods are tried to rescue the “mega-fauna”, one of which results in a kind of blow-back that causes casualties resulting in a court-martial and the transfer of a crew member, Callaway, to another ship. Much of the story could actually be a naval rather than space adventure—we keep thinking of rescues at sea and the relationships between most of the characters are just what you might expect here (essentially, this seems to be the British navy, with ship-names like Regina and Andromache). It may nor may not be significant that the wider background to the story is glossed over: part of our protagonists’ cover-story is that they come from a planet (Teleka) deliberately chosen as remote. And while much of the focus is on the physics of a black hole, and how to get what on the back cover are described as planet-sized objects out of its influence, there also seems to be an awful lot of scientific hand-waving going on—at one point they seem to be using chains to tow these beings out of the Black Hole’s influence! 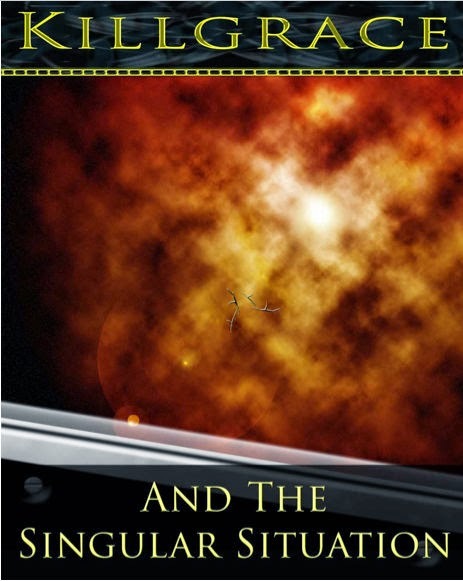 However, the squabbling crew of the spaceship is well done, and the hints at tensions and a much wider back-story between Susan and Cet certainly draw the reader in, though the novella-length of the story frustrates any wish for development, and while readers who have started at the beginning may well understand more clearly what has been going on, all I had was the summary. There is a reason, apparently, why the alien uses the name “Killgrace”, and it seems not to be a pretty one. It’s also rather odd that no-one seems to be curious about what this “mega-fauna” might be—even whether they want to be rescued. From the little we are given about them, they could be interesting, and it would have been nice to have had our imaginations pushed a bit more. It’s also unclear whether humanoid-Susan (presumably a ‘cover name’) is the viewpoint character because she is nearest to human (and therefore we can identify with her) or whether there’s something else going on. Price’s website (killgrace.co.uk) suggests a much more worked-out scenario than is apparent from this book, so all I can do is hint: there does seem to be. Despite all this, there’s a wry, old-school serial-story air to this project which is ultimately appealing, and in this particular episode a rather touching poignancy to scenes where we are reminded of the enforced separation from loved ones that space travel in a Relativity-based continuum entails. One character muses on the economic choice: stay at home and struggle to raise a family or “choose a career on the front line” and support your family from afar. Your crew becomes your family-substitute. The punishment of Callaway becomes more explicable as a punishment: he has effectively been expelled from his family. There’s also a suggestion that the trajectory of Susan/Cet’s journey is going to take them into universes with different physical laws, and through historical periods in our own timeline. This is where what is essentially a book of entertainment for not-too-demanding readers becomes interesting, and where I started wishing the book was longer. There are another seven titles listed here, and apparently more online, and I suspect that readers with a fondness for traditional SF could get hooked.